It also may extend through the stomach wall and spread to nearby lymph nodes and to organs such as the liver, pancreas, and colon. Stomach cancer also may spread to distant organs, such as the lungs, the lymph nodes above the collar bone, and the ovaries. Stomach cancer is still the second biggest killer of all cancers and early detection is vital for survival. Stomach cancers are classified according to the type of tissue where they originate. The most common type of stomach cancer is adenocarcinoma, which starts in the glandular tissue of the stomach and accounts for 90% to 95% of all stomach cancers. Other forms of stomach cancer include lymphomas, which involve the lymphatic system and sarcomas, which involve the connective tissue (such as muscle, fat, or blood vessels). If you have the slightest suspicion of any of the symptoms mentioned, you should contact your doctor at once for an assessment. About nine in 10 stomach cancers are adenocarcinomas. This type of stomach cancer starts in the glandular cells that produce mucus and stomach juices. 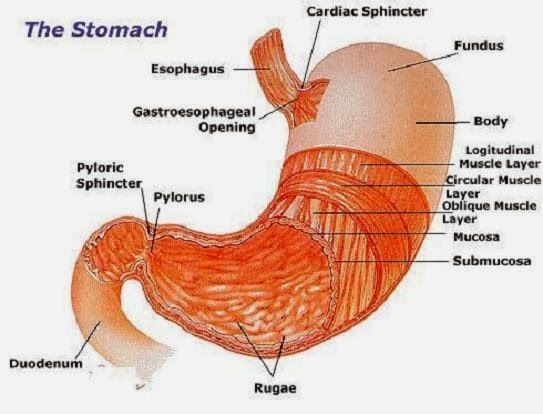 What Causes Stomach (Gastric) Cancer? Gender -- men have more than double the risk of getting stomach cancer than women. Race -- being African-American or Asian may increase your risk. Geography -- stomach cancer is more common in Japan, the former Soviet Union, and parts of Central America and South America. Blood type -- individuals with blood group A may be at increased risk. Advanced age -- stomach cancer occurs more often around ages 70 and 74 in men and women, respectively. Family history of gastric cancer can double or triple the risk of stomach cancer. Lifestyle factors such as smoking, drinking alcohol, and eating a diet low in fruits and vegetables or high in salted, smoked, or nitrate-preserved foods may increase your risk. Helicobacter pylori (H. pylori) infection of the stomach. H. pylori is a bacterium that infects the lining of the stomach and causes chronic inflammation and ulcers. Certain health conditions including chronic gastritis, pernicious anemia, gastric polyps, intestinal metaplasia, and prior stomach surgery. Work-related exposure due to coal mining, nickel refining, and rubber and timber processing and asbestos exposure. 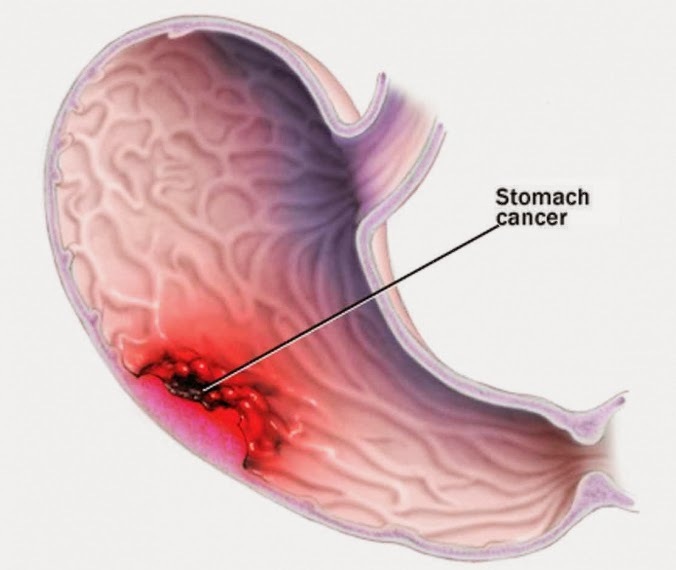 What Are the Symptoms of Stomach (Gastric) Cancer? Stomach cancer can be hard to find early. Often there are no symptoms in the early stages and, in many cases, the cancer has spread before it is found. When symptoms do occur, they are often so vague that the person ignores them. These symptoms are similar to those caused by a peptic ulcer. If you are experiencing any of these symptoms you should see your health care provider so that a proper diagnosis can be made and timely treatment given. A stomach cancer can grow very large before it causes other symptoms. 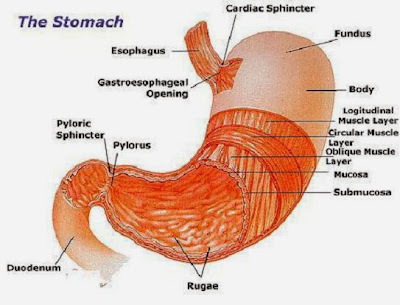 Pain or bloating in the stomach after eating. A check for hidden (occult) blood in the stool. This test is done by placing a small amount of stool on a plastic slide or on special paper. It may be tested in the doctor's office or sent to a laboratory. This test is done because stomach cancer sometimes causes bleeding that cannot be seen. However, noncancerous conditions also may cause bleeding, so having blood in the stool does not necessarily mean that a person has cancer. X-rays of the esophagus and stomach (the upper gastrointestinal, or GI, tract. The x-rays are taken after the patient drinks a barium solution, a thick, chalky liquid. (This test is sometimes called a barium swallow.) The barium outlines the stomach on the x-rays, helping the doctor find tumors or other abnormal areas. During the test, the doctor may pump air into the stomach to make small tumors easier to see. An exam of the esophagus and stomach using a thin, lighted tube called a gastroscope, which is passed through the mouth and esophagus to the stomach. The patient's throat is sprayed with a local anesthetic to reduce discomfort and gagging. Patients also may receive medicine to relax them. Through the gastroscope, the doctor can look directly at the inside of the stomach. If an abnormal area is found, the doctor can remove some tissue through the gastroscope. Another doctor, a pathologist, examines the tissue under a microscope to check for cancer cells. This procedure -- removing tissue and examining it under a microscope -- is called a biopsy. A biopsy is the only sure way to know whether cancer cells are present. How Is Stomach (Gastric) Cancer staged? Staging is a tool used by doctors to determine the extent of the disease as well as the best treatment options available. It also gives an indication of prognosis or survival. To stage stomach cancer, the main investigation used is a CT or computerised tomography scan. CT provides fine detail of your organs and allows your doctor to check the rest of your body for evidence of cancer spread. Sometimes, a different type of gastroscopy called an endoultrasound test is performed after the tumour has been diagnosed. An endoultasound is carried out in the same way as a gastroscopy, but with the addition of a special ultrasound probe on the tip of the gastroscope. The doctor develops a treatment plan to fit each patient's needs. Treatment for stomach cancer depends on the size, location, and extent of the tumor; the stage of the disease; the patient's general health; and other factors. Many people who have cancer want to learn all they can about the disease and their treatment choices so they can take an active part in decisions about their medical care. The doctor is the best person to answer questions about their diagnosis and treatment plan. When a person is diagnosed with cancer, shock and stress are natural reactions. These feelings may make it difficult for people to think of everything they want to ask the doctor. Often, it helps to make a list of questions. Also, to help remember what the doctor says, patients may take notes or ask whether they may use a tape recorder. Some people also want to have a family member or friend with them when they talk to the doctor -- to take part in the discussion, to take notes, or just to listen. Patients should not feel the need to ask all their questions or remember all the answers at one time. They will have other chances to ask the doctor to explain things and to get more information. When talking about treatment choices, the patient may want to ask about taking part in a research study. What are my treatment options? Which do you suggest for me? Why? Patients and their loved ones are naturally concerned about the effectiveness of the treatment. Sometimes they use statistics to try to figure out whether the patient will be cured, or how long he or she will live. It is important to remember, however, that statistics are averages based on large numbers of patients. They cannot be used to predict what will happen to a particular person because no two cancer patients are alike; treatments and responses vary greatly. Patients may want to talk with the doctor about the chance of recovery (prognosis). When doctors talk about surviving cancer, they may use the term remission rather than cure. Even though many patients recover completely, doctors use this term because the disease can return. Cancer of the stomach is difficult to cure unless it is found in an early stage (before it has begun to spread). Unfortunately, because stomach cancer symptoms in the early stages tend to be few, the disease is usually advanced when the diagnosis is made. However, advanced stomach cancer can be treated and the symptoms can be relieved. Treatment for stomach cancer may include surgery, chemotherapy, and/or radiation therapy. New treatment approaches such as biological therapy and improved ways of using current methods are being studied in clinical trials. A patient may have one form of treatment or a combination of treatments. How will I feel afterwards? If I have pain, how will you help me? Will I need a special diet? Who will teach me about my diet? Will the drugs cause side effects? What can I do about them? Radiation therapy (also called radiotherapy) is the use of high-energy rays to damage cancer cells and stop them from growing. Like surgery, it is local therapy; the radiation can affect cancer cells only in the treated area. Radiation therapy is sometimes given after surgery to destroy cancer cells that may remain in the area. Researchers are conducting clinical trials to find out whether it is helpful to give radiation therapy during surgery (intraoperative radiation therapy). Radiation therapy may also be used to relieve pain or blockage. The patient goes to the hospital or clinic each day for radiation therapy. Usually treatments are given 5 days a week for 5 to 6 weeks. Biological therapy (also called immunotherapy) is a form of treatment that helps the body's immune system attack and destroy cancer cells; it may also help the body recover from some of the side effects of treatment. In clinical trials, doctors are studying biological therapy in combination with other treatments to try to prevent a recurrence of stomach cancer. In another use of biological therapy, patients who have low blood cell counts during or after chemotherapy may receive colony-stimulating factors to help restore the blood cell levels. Patients may need to stay in the hospital while receiving some types of biological therapy. Many patients with stomach cancer are treated in clinical trials (treatment studies). Doctors conduct clinical trials to find out whether a new approach is both safe and effective and to answer scientific questions. Patients who take part in these studies are often the first to receive treatments that have shown promise in laboratory research. In clinical trials, some patients may receive the new treatment while others receive the standard approach. In this way, doctors can compare different therapies. Patients who take part in a trial make an important contribution to medical science and may have the first chance to benefit from improved treatment methods. Researchers also use clinical trials to look for ways to reduce the side effects of treatment and to improve the quality of patients' lives. Many clinical trials for people with stomach cancer are under way. Patients who are interested in taking part in a trial should talk with their doctor. One way to learn about clinical trials is through PDQ, a computer database developed by the National Cancer Institute. PDQ contains information about cancer treatment and about clinical trials. The Cancer Information Service can provide PDQ information to doctors, patients, and the public. Some gastrectomy patients have cramps, nausea, diarrhea, and dizziness shortly after eating because food and liquid enter the small intestine too quickly. This group of symptoms is called the dumping syndrome. Foods containing high amounts of sugar often make stomach cancer symptoms worse. The dumping syndrome can be treated by changing the patient's diet. Doctors often advise patients to eat several small meals throughout the day, to avoid foods that contain sugar, and to eat foods high in protein. To reduce the amount of fluid that enters the small intestine, patients are usually encouraged not to drink at mealtimes. Medicine also can help control the dumping syndrome. The symptoms usually disappear in 3 to 12 months, but they may be permanent. Talk to your GP if you need further advice and information. What Is the Prognosis for People With Stomach (Gastric) Cancer? Stomach cancer is difficult to cure unless it is found at an early stage before it has spread. Unfortunately, because early stomach cancer has few symptoms, the disease is usually advanced when the diagnosis is made. However, advanced stomach cancer can be treated and the symptoms can be relieved. Before starting treatment, you might want a second opinion from another doctor about your diagnosis and treatment plan. Some people worry that their doctor will be offended if they ask for a second opinion. Usually the opposite is true. Most doctors welcome a second opinion. And many health insurance companies will pay for a second opinion if you or your doctor requests it. Some companies require a second opinion. It may take some time and effort to gather your medical records and see another doctor. Usually it's not a problem if it takes you several weeks to get a second opinion. In most cases, the delay in starting treatment will not make treatment less effective. To make sure, you should discuss this possible delay with your doctor. Some people with stomach cancer need treatment right away. It is sometimes difficult for patients who have been treated for stomach cancer to eat well. Cancer often causes loss of appetite, and people may not feel like eating when they are uncomfortable or tired. It is hard for patients to eat when they have nausea, vomiting, mouth sores, or the dumping syndrome. Patients who have had stomach surgery are likely to feel full after eating only a small amount of food. For some patients, the taste of food changes. Still, good nutrition is important. Eating well means getting enough calories and protein to help prevent weight loss, regain strength, and rebuild normal tissues. Doctors, nurses, and dietitians can offer advice for healthy eating during and after cancer treatment. Living with a serious disease is not easy. Cancer patients and those who care about them face many problems and challenges. Coping with these problems is often easier when people have helpful information and support services. Cancer patients may worry about holding their job, caring for their family, or keeping up with their daily activities. Concerns about tests, treatments, hospital stays, and medical bills are common. Doctors, nurses, and other members of the health care team can answer questions about treatment, working, or other activities. Meeting with a social worker, counselor, or member of the clergy also can be helpful for patients who want to talk about their feelings or discuss their concerns about the future or about personal relationships. Often, a social worker at the hospital or clinic can suggest groups that can help with rehabilitation, emotional support, financial aid, transportation, or home care. For example, the American Cancer Society has many services for cancer patients and their families. Local offices of the American Cancer Society are listed in the white pages of the telephone directory. The Cancer Information Service also has information on local resources.